Over time I've grown more impressed with the iBagBar Small Messenger Bag. It's small enough to drag everywhere, yet big enough to hold solutions to many a challenge. Whether at a concert, or hiking in the woods, the basic black canvas look lets the bag blend in (at least as much as a guy carrying a purse can). The simple, vecro-less flap means that you can silently access the bag contents. Heck, I've even learned a technique for wearing the bag as an improvised backpack (see this action shot), which came in handy for a recent bike tour. * And finally, the price tag of $20 seals the deal. This bag is a winner. That's right, the leather attachment that keeps the shoulder strap in place failed in a most spectacular fashion. Just like that, the bag that was so great was now useless. I could immediately imagine the response from folks over at EDCForums. That's what you get for buying a $20 bag. If you'd spent hundreds, you wouldn't be in this situation. On a whim, I contacted the company through Amazon and sent them the above photo. 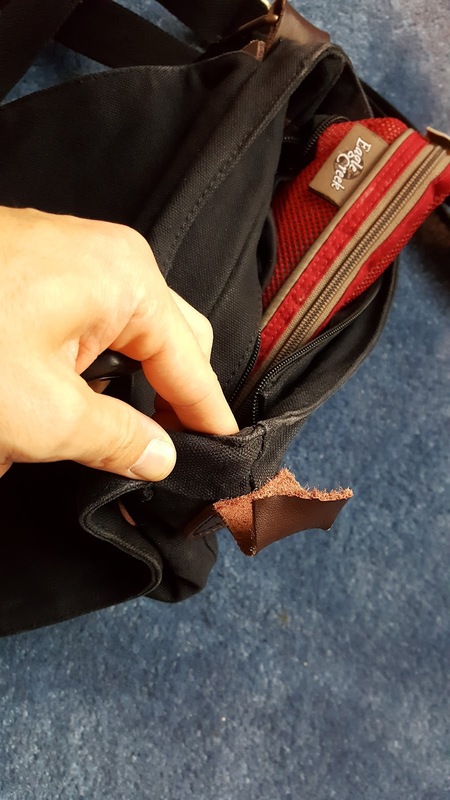 Within a couple of hours they responded: your bag was defective, a new one is on the way. I have to admit, I was impressed. And then the new one arrived and again found myself in a new quandary: the bag looked perfect, but the magnetic closure holding the front of it was far weaker than the original bag. It seemed almost silly to go back and kvetch about this. Still, I created a video showing the problem and sent it off to the company. Again, they immediately responded with an apology that I had yet another defective bag. They shipped off a third bag to me which arrived in perfect condition. And so I ended this little customer service experience even more impressed. There was no debate as to whether I was mis-using the bag, or had improper expectations of its functionality. There was just singular focus on making me happy. *I've searched the Internet high and low to find the video that showed me this clever messenger-bag-as-backpack technique. Yet, for the life of me, I can't find it again. If you're really curious how to wear a messenger bag/haversack/shoulder bag as a backpack let me know, I'll document this for you.